This short story doesn't lose its inspiring power even today. The Christian Centre BEREA seeks to follow the example of Paul and his team and bring the gospel - good news - to today's men and women. It is open to look for new ways of communication, that would serve to spread the old and yet relevant message. It also follows the example of the Berean Jews in considering the Scripture and not tradition or human reason to be the final judge in matters of belief and practice. Welcome to the homesite of CC BEREA! Do look around and discover. 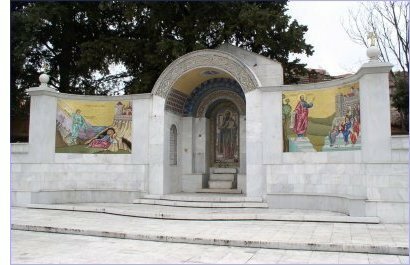 Chapel at the place of the Jewish synagogue in Veria. 7th missionary conference in Modra-Harmonia with guests from the UK, the Netherlands and Czech Republic is over. Since spring, many volunteers came and worked at the building site of Berea. One group arrived from Germany and USA, another from the UK and the Faroes. Visit our Picture Gallery seeing their selfless labor of love. See also update information about the reconstruction. The evangelist Allen Buchanek is visiting Slovakia.